Today’s opening of the new US embassy in Jerusalem was clowded with massive in Gaza, reportedly the bloodiest clash in several years. A total of at least 50 Palestinians were shot dead by the Israeli forces in what is said to the bloodiest clash since the end of the 2014 Gaza war. 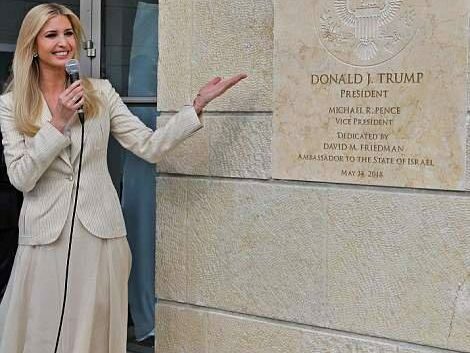 The Palestinians were shot only 50 miles from wherethe US President Donald Trump’s daughter Ivanka Trump, her husband and American dignitaries were assembled to celebrate the embassy opening of the new , Jerusalem US embassy. The Gaza border was reportedly overwhelmed by tens of thousands of Palestinian protesters who met resistance from Israeli snipers. It is reported that the Israel military claimed that it opened fire to stop Hamas, the Islamist militant group that controls Gaza, from using the protests as a distraction to break through the border fence and carry out attacks inside Israel. However Palestinians claim that the greater majority of the dead victims, were unarmed civilians protesting and the Palestinian Authority accused Israel of carrying out “a terrible massacre” and called for international intervention to stop the killing. Despite the bloodshed, US president Donald Trump hailed the day as “a great day for Israel” and said he believed his decision to move the US embassy from Tel Aviv to Jerusalem would ultimately help forge peace between Israelis and Palestinians. Britain’s Downing Street said the US embassy opening in Jerusalem was “unhelpful in terms of prospects for peace in the region” and many Arab and Muslim countries strongly condemned both the US and Israel. “The United States has chosen to be a part of the problem rather than the solution with its latest step and has lost its mediating role in the peace process,” said Recep Tayyip Erdogan, the Turkish president, in a speech in London. Palestinian health officials said 52 people were killed along the Gaza border, including six children under the age of 18. The youngest fatality appeared to be a 14-year-old boy named Ezzaldeen al-sammak. More than 1,200 others were shot and wounded during Monday’s protests, according to the Palestinian health ministry.